Community Eye Health Journal » HIV/AIDS: what is the impact on prevention of blindness programmes? Comm Eye Health Vol. 16 No. 47 2003 pp 33-34. Published online 01 September 2003. HIV/AIDS: what is the impact on prevention of blindness programmes? Despite the fact that 95% of the world’s 42 million people who have HIV/AIDS live in poor countries, most medical literature on the ocular problems still focuses on problems in the industrialized countries. This is unfortunate, as there are many differences in the way the epidemic manifests itself in the poor countries compared to the industrialized world, including higher mortality rates earlier in the course of the disease. These differences, due to different available treatments for the virus and opportunistic infections, and differences in endemnicity of other opportunistic diseases, were apparent early in the epidemic. In the past few years, the availability of highly active anti-retroviral treatment (HAART) in the industrialized countries has widened the gap even more dramatically. Many formerly busy HIV/AIDS eye clinics in the industrialized countries have few patients now. HAART, however, is still available to only a very small fraction of those who need it, and there is still disproportionately little research on the major ocular manifestations in the poor countries. No one who lives in sub-Saharan Africa, where nearly 30 million people are infected, can be unaware of the tremendous impact that the epidemic has on health care. Medical and paediatric wards are overflowing with HIV-related problems. There is a direct and indirect impact on eye care services as well. Herpes zoster ophthalmicus (HZO), demonstrated to be a marker for early HIV infection in young Africans over a decade ago, is a dramatic manifestation, although the magnitude of the problem may not be quite as large as was once imagined. A population based study in Uganda reported an incidence rate of general herpes zoster in HIV infected people of 35.6/1000 person-years, but only 4.25% of this was HZO.1 This would result in 40-60 cases per year in a severely affected urban area such as Blantyre, Malawi, which is consistent with the records and the experience of ophthalmologists there. The association of HIV with certain malignancies, such as Kaposi’s sarcoma and squamous cell carcinoma of the conjunctiva, has been well documented. 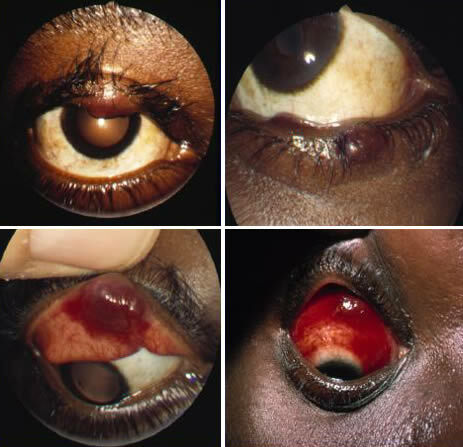 Studies in Tanzania and Uganda demonstrated 5 and 6 – fold increases, respectively, in the number of conjunctival squamous cell tumours during the 1990s. An article in this Issue describes the problem in urban Zimbabwe. Review of the operating theatre records at the Queen Elizabeth Central Hospital (QECH) in Blantyre, Malawi reveals a 10-fold increase in the number of ‘conjunctival tumours’ removed there between 1989 and 2002. Alarmingly, the number of exenterations, primarily for squamous cell carcinoma, has also gradually increased, from an average of one or two per year in the 1980s to ten in 2002. We do not know, however, whether these exenterations are required for recurrences, especially aggressive tumours, or simply long neglected tumours. There has been a general impression that these lesions may be unusually aggressive in HIV infected Africans, but a recent study, using specific tumour markers challenges this view.2 The epidemiological picture remains unclear. Regarding cytomegalovirus retinitis (CMVR), the most well known manifestation in industrialized countries, existing data indicate that the point prevalence of this in sub-Saharan Africa is low. This confirms the clinical impression of ophthalmologists in public clinics that CMVR does not constitute a major burden in the region. A number of HIV/AIDS patients probably die before CMV retinitis develops, while others may develop it near the end of life and are too sick to present to eye clinics. It has been suggested that more widespread availability of anti-retrovirals in Africa could change the picture.3 HAART, used properly, would be likely to decrease the incidence of all ocular manifestations. 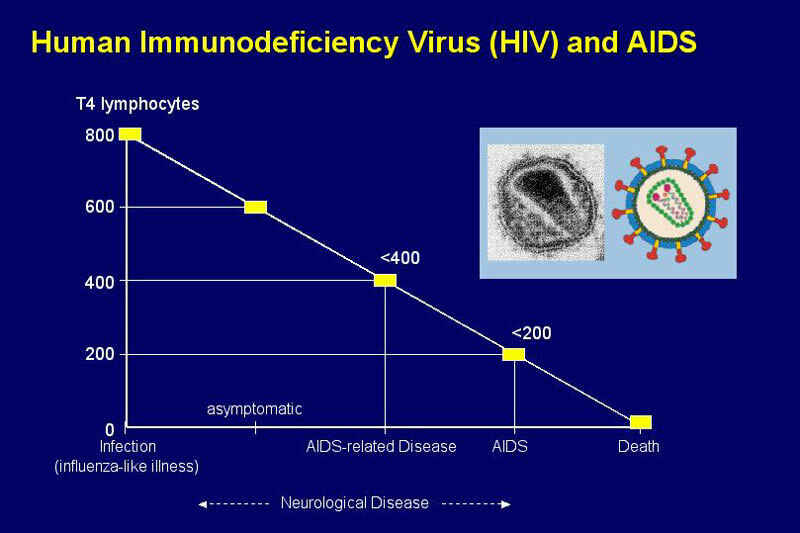 If it were misused, however, or if less expensive regimens of one or two drugs were used, therapy could prolong lives, but not reconstitute the immune system, potentially resulting in more patients with low CD4 counts living with HIV, and a rise in the prevalence of CMV retinitis. Even this situation, alarming as it sounds, would be unlikely to change the magnitude of blindness in sub-Saharan Africa. Cataract, childhood blindness, trachoma, and glaucoma will still be responsible for most of the blind-person years. This does not mean, however, that the HIV/AIDS epidemic is not affecting eye care services – it does in several ways. The burden created by HIV-related eye disease in a clinic or hospital varies depending on how cases are managed. For example, the fastest, cheapest way to treat conjunctival growths is simple excision by nurses or clinical officers without a microscope. Is this adequate to treat most squamous cell lesions? Alternatives, such as more highly trained surgeons, microsurgery, histopathologic verification of disease free margins, and adjunctive therapy (e.g., cryo, mitomycin, or 5FU drops) will increase the time and cost of treatment. Is this necessary to avoid a ‘significant’ number of recurrences? We do not know the cost/benefit of this, but we may need to consider it. At the QECH in Malawi, one morning theatre list each week is devoted to removal (by simple excision) of conjunctival tumours. In 2002, these accounted for 14% of the surgical cases done at the base hospital. In the same way, we should consider the most effective way of treating patients with HZO, in situations where acyclovir is not available. Although not large in number, their suffering is great, their care can be time consuming and, without antiviral drugs, the visual outcome is frequently poor. Finally, a tragic impact of the HIV/AIDS epidemic on eye care is the fact that eye care workers themselves are succumbing to it. Again, there are no statistics compiled, but many large eye clinics or hospitals have lost clinical officers, nurses or doctors to AIDS. Given the shortage of trained personnel, a single death can have a major impact on a programme. A cause for optimism in the HIV/AIDS story in Africa is that the anti-HIV drugs which have transformed and prolonged the lives of HIV sufferers in the West are increasingly available in Africa. A few large companies have begun to offer the drugs to workers. There are some NGO and government programmes that offer drugs to patients, although the availability of drugs to patients through these programmes varies in different countries. The WHO made a recent public commitment to try to increase the number of sub-Saharan Africans on HAART – to 3 million by 2005. This, however, still represents only 10% of those infected now, so the majority may remain untreated for some time. The final toll of the epidemic on eye care services and prevention of blindness work remains to be seen. We would do well to gather more information and consider these issues in planning our programmes. 1 Morgan D, Mahe C, Malamba S, Okongo M, Mayanja B, Whitworth J. Herpes zoster and HIV-1 infection in a rural Ugandan cohort. J AIDS 2001; 15(2): 223-229. 2 Mahomed A, Chetty R. Human immunodeficiency virus infection, Bcl-2, p53 protein, and Ki-67 analysis in ocular surface squamous neoplasia. Arch Ophthalmol 2002; 120 (5): 554-558. 3 Kestelyn P G, Cunningham E T. HIV/AIDS and blindness. Bull World Health Organ 2001; 79: 208-213. Thanks to Dr Nkume Batumba in Blantyre, Malawi for sharing data and experience.